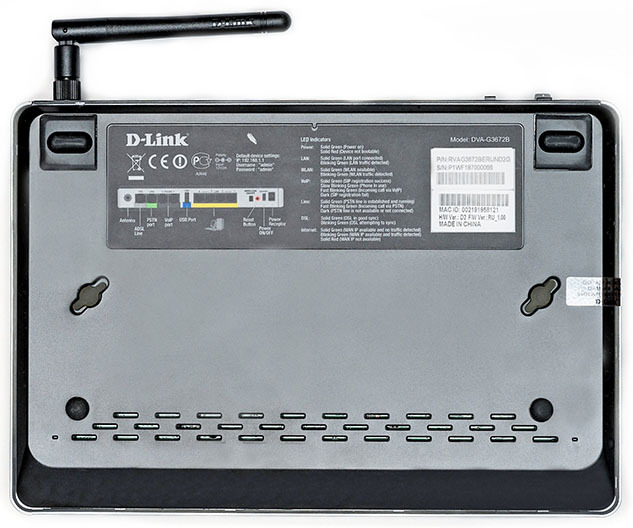 We have already tested several wireless ADSL routers, DSLAM D-Link DAS-3248EC included, but today the guest in our laboratory is not just another simple modem, but a device that has a wide array of voice functions. Let's sort through its capabilities in more detail. 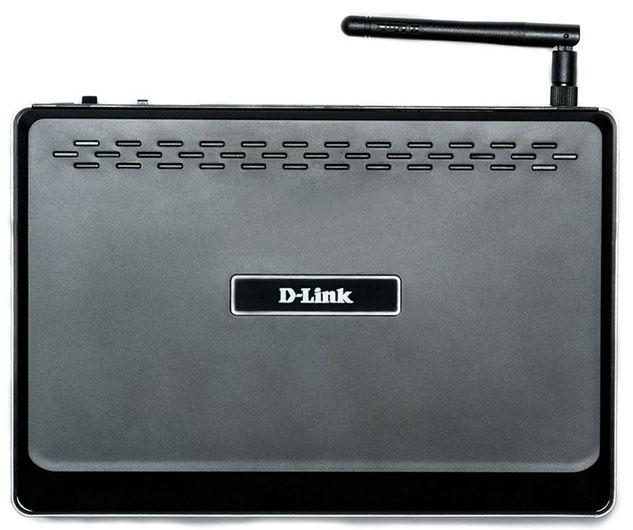 ADSL2+ D-Link DVA-G3672B wireless router comes in a black plastic case with rounded corners and a grey stripe on the sides. The device has dimensions of 218x148x35 mm (not considering the antenna). 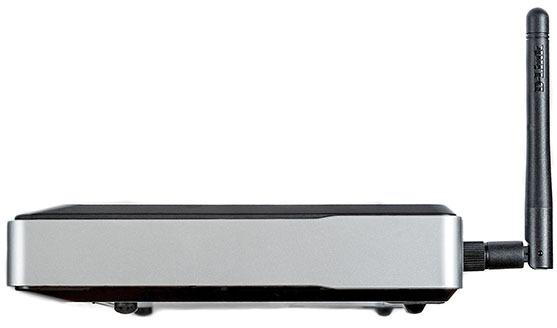 To work properly DVA-G3672B needs an external power unit with the following characteristics: 12V and 5А. On the upper panel of the device there is a brand tag and ventilation grate. On the bottom of the device there are ventilation grate and a sticker with brief information about its specifications. Apart from it, there are four rubber legs and two tooling holes used to mount the device on the wall. The front panel has LEDs indicating the device status, as well those of its wired ports, located on it. In addition, the LEDs can help a user to find out whether a USB device is connected to the device, learn the wireless network status, availability of an ADSL signal, presence of analogue phones connected to the device, as well as the availability of access to the WAN. Side panels of DVA-G3672B are not remarkable at all. On the rear panel there are four Fast Ethernet ports, a hardware switch for putting the wireless network on or off, sunken Reset button used to reset the user settings, power socket with a switch, USB 2.0 port, four RJ-11 ports used for ADSL and POTS connection, as well as for connection of two analogue phones. 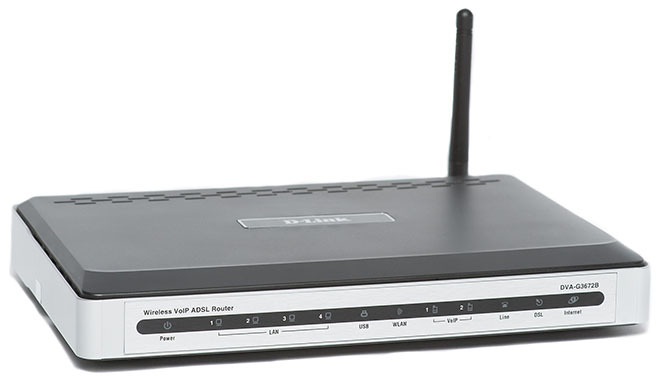 Also, we would like to point out that DVA-G3672B enables a connection to the line not only for purposes of obtaining ADSL data, but also for providing two analogue phones with access to the POTS. 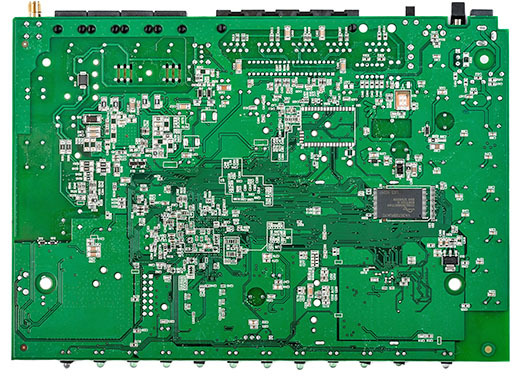 The electronic stuffing of DVA-G3672B is one green textolite card which has all essential elements located on one of its sides. The only exception is Spansion S29GL064N90TFI04 flash memory module with the size of 8 Mbytes. Broadcom BCM4318KFBG chip and SiGe 2521A60 amplifier act as the wireless module. 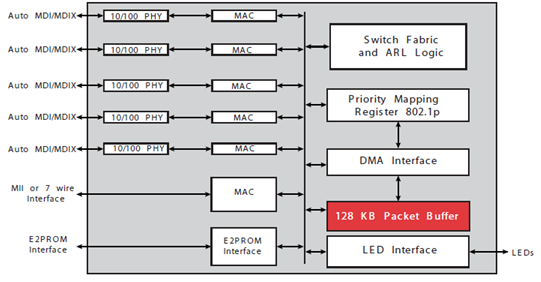 A chart for Fast Ethernet Broadcom BCM5325EKQMG switch with five ports used is presented below. 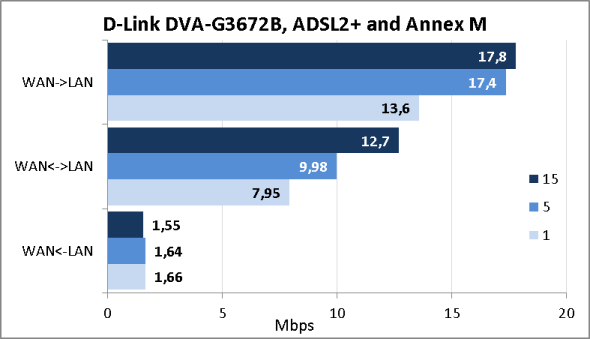 We have already seen such kind of a switch previously in ASUS WMVN25E2+ and ASUS DSL-G31 devices. 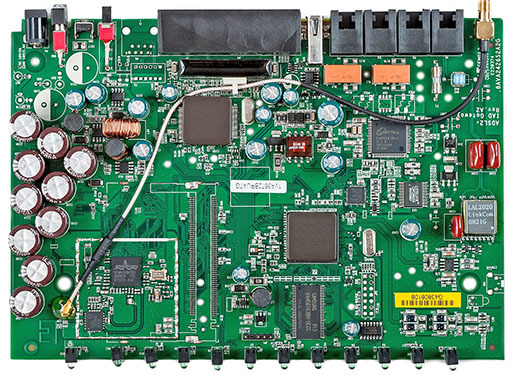 Voice processing means are carried out by Legerity (Zarlink/Microsemi) Le88221DLC module, while Broadcom BCM6358KFBG performs functions of a SoC with support of ADSL2+. Also, it would be fair to note Samsung K4H561638H RAM module with the size of 32 Mbytes. 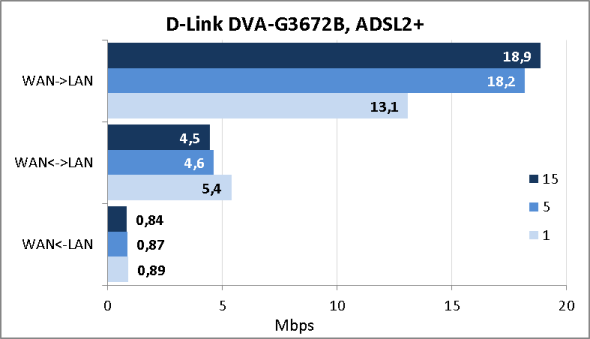 That is where we bring the review of the hardware platform of D-Link DVA-G3672B to a conclusion and pass on to examining capabilities of its software component. 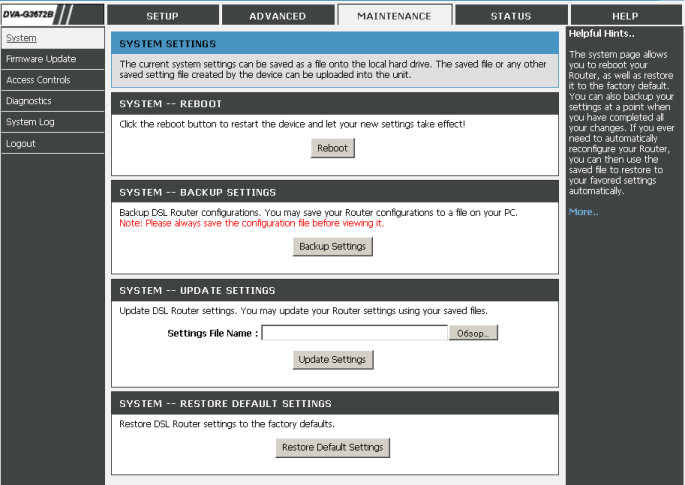 Firmware update is carried out in Firmware Update menu item, MAINTENANCE tab of the web-interface. The whole firmware update process takes about two minutes and does not require any technical proficiency from an administrator. 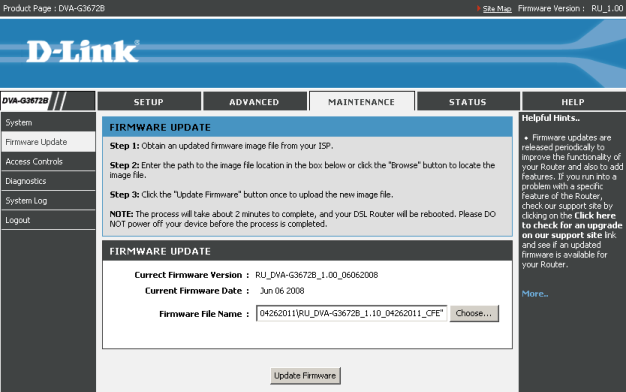 It is easy enough, one just needs to choose a file with the new firmware version and click on Update Firmware button. The same can be performed by using the device command line (/Management/Update Software/Update Software). However, it's worth noticing that in this case one would need to have a TFTP server. Allocating 4405444 bytes for broadcom image. 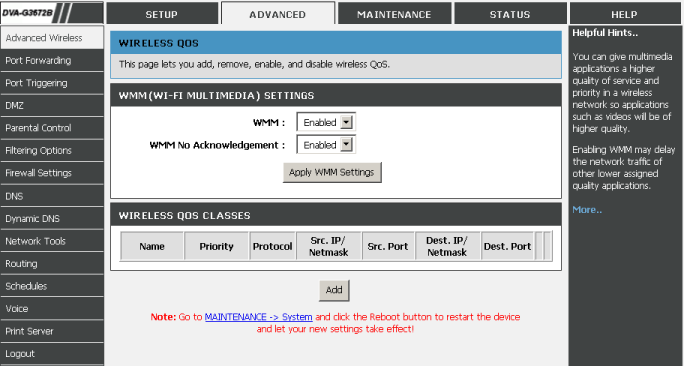 After that the router will automatically reboot itself and get ready for further work. Another firmware update method is using a built-in TFTP server. One only needs to upload the firmware update file to it. An example of the command that uploads the necessary file to the TFTP server in Windows OS is presented below. 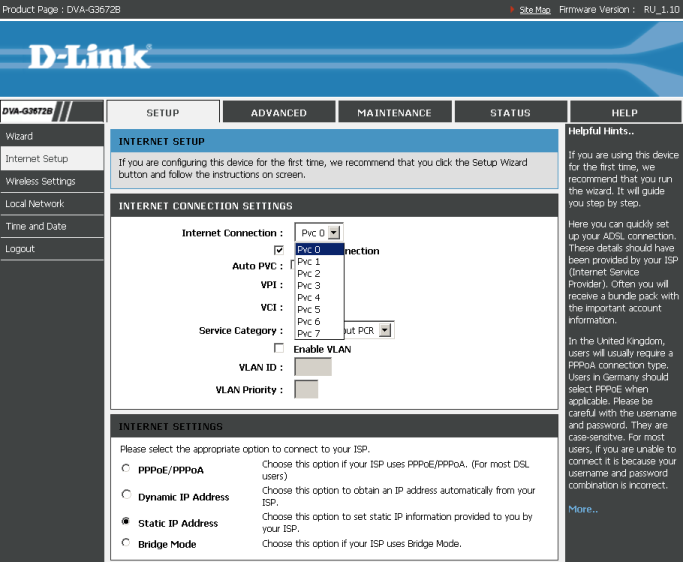 Now let's review capabilities of D-Link DVA-G3672B web-interface. In order to access the device web-interface one should use any modern browser and type in logon information upon authorisation; it is admin/admin by default. The web-interface design is common for all devices by this brand. We would like to inform our readers beforehand that we will not review all capabilities of DVA-G3672B, but only turn our attention to the most interesting features. 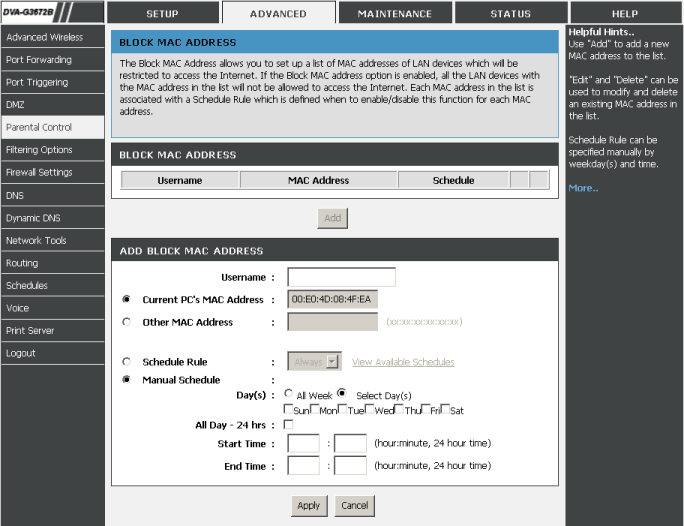 By using Internet Setup menu item an administrator can manage up to eight simultaneous connections to the provider used to transfer data, receive IPTV services, or for any other purposes. We would like to give a bit of explanation on the available connection types. The following data encapsulation process will take place upon choosing a connection type starting with Bridged IP: IP->Ethernet->ATM. 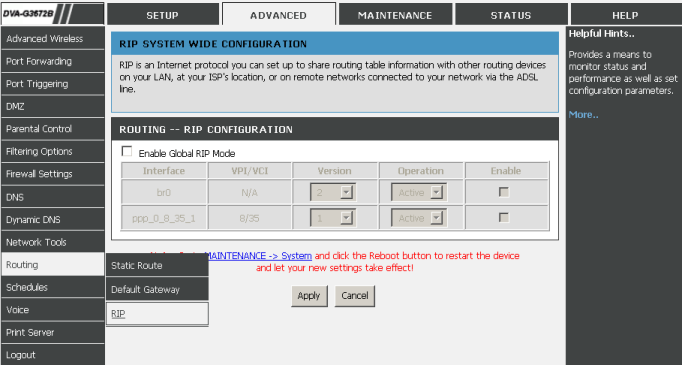 While upon choosing Routed IP the data encapsulation process will be as follows: IP->ATM. If it's necessary, the administrator can also create a PPTP tunnel over the connection that has been already created. 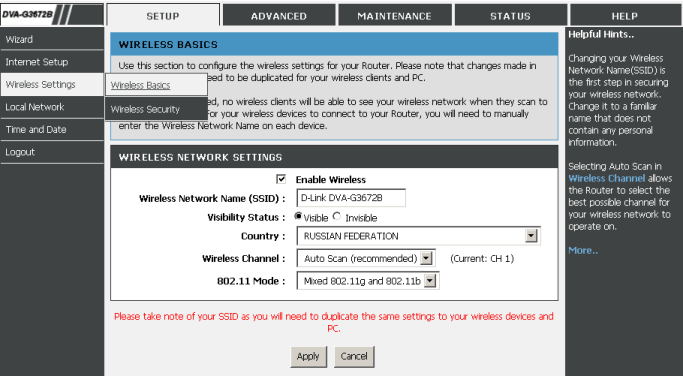 Wireless Basics and Wireless Security sections in Wireless Settings menu item of SETUP tab allow the administrator to manage the wireless network operation mode. 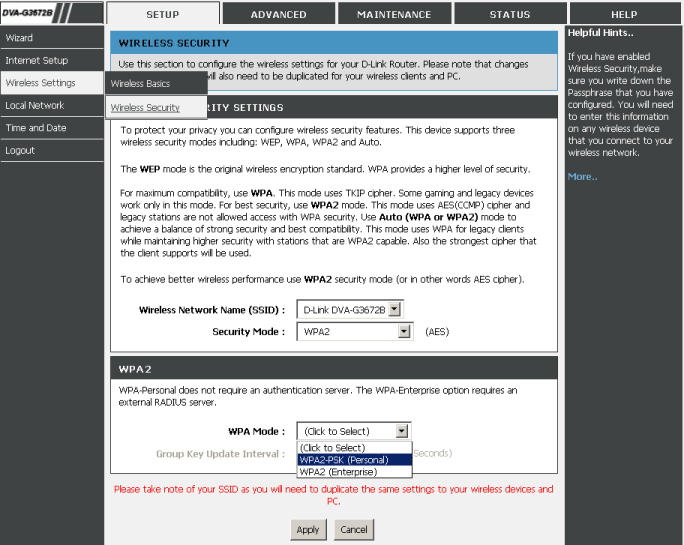 One can also turn the Wi-Fi module on or off using the hardware switch located on the rear side of the router. 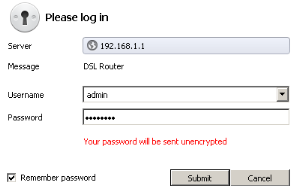 Using Local Network menu item the administrator can specify the IP-address for the LAN interface and set the DHCP server operation parameters. Managing the data synchronisation parameters with servers over the Internet is performed using Time and Date menu item. Unfortunately, the device time zones do not include the day-light saving time amendments which were recently made in the Russian legislature. In order to carry out a more detailed adjustment of the wireless network segment one needs to use sections of Advanced Wireless menu item, ADVANCED tab. 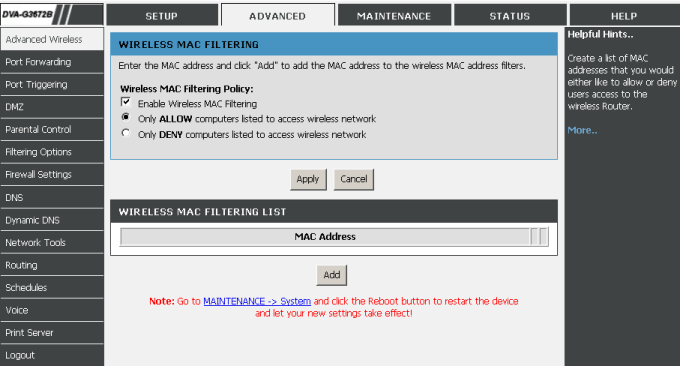 Over here the administrator can manage filtering of the wireless clients through MAC-addresses and change QoS parameters. 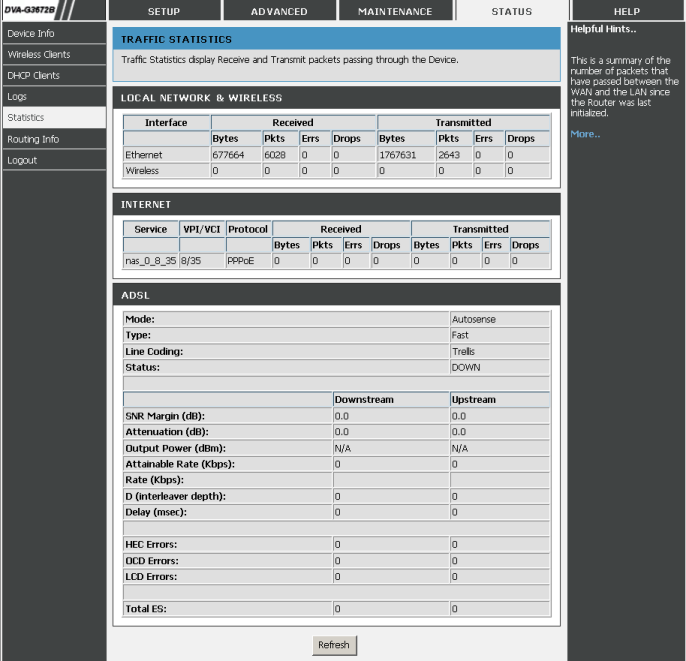 Port Forwarding, Port Triggering, and DMZ menu items are used to provide access to the internal services from the WAN. 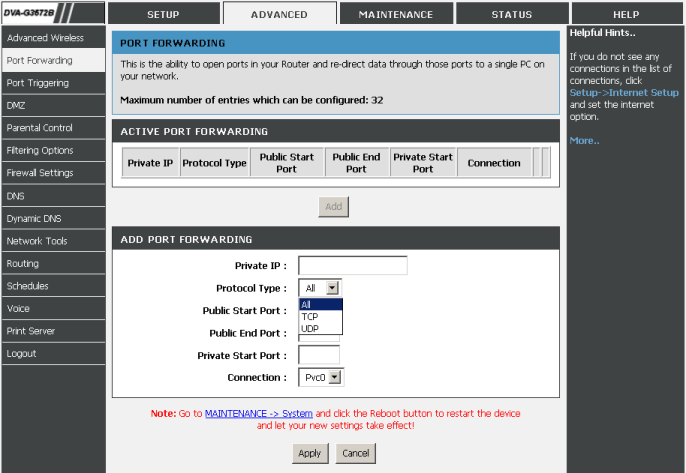 By using sections in Parental Control menu item one can filter the access to certain WAN resources from various nodes according to schedule. 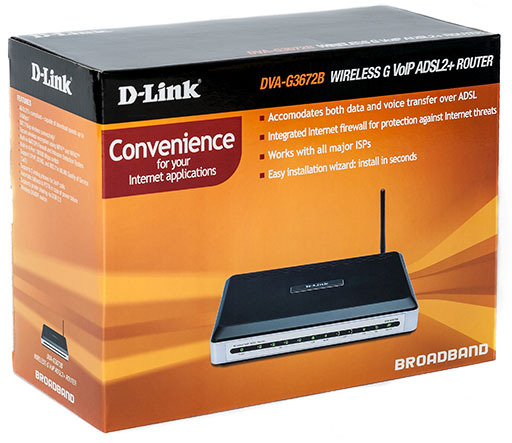 D-Link DVA-G3672B can filter incoming and outgoing traffic both when acting as a router and bridge. Applicable settings can be configured in sections of Filtering Options menu item. 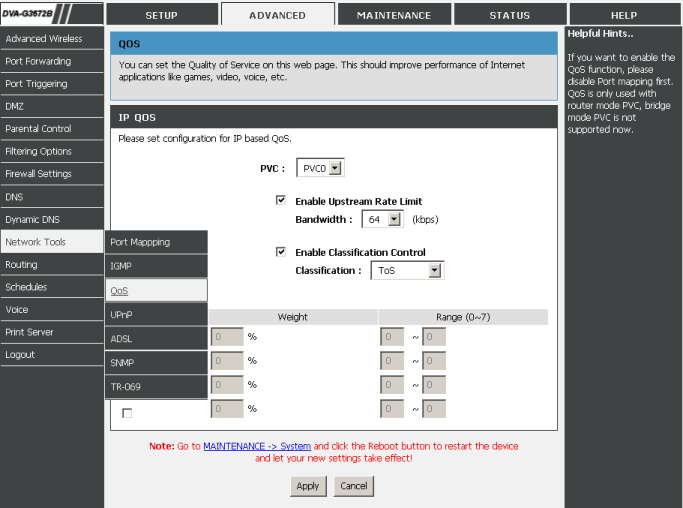 One can switch on protection against DOS attacks in Firewall Settings menu items. 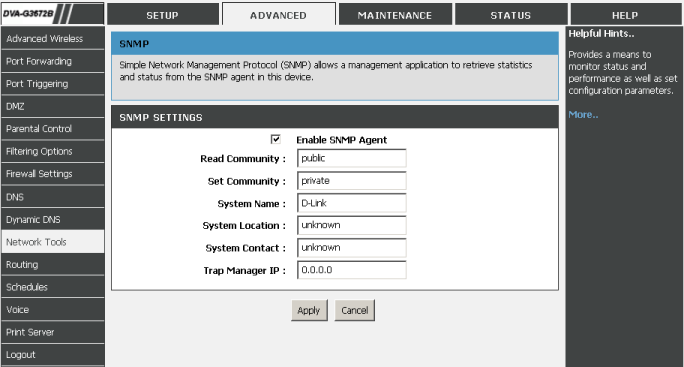 Using sections of Network Tools menu item the administrator can manage multicast traffic and QoS settings, change the ADSL operation parameters, as well as manage the access to the device through SNMP. 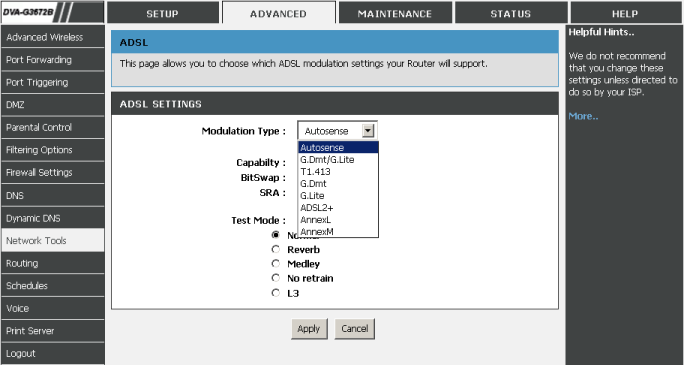 Also, one can utilise the router auto configuration function over here. Sections of Routing menu item are responsible for routing. 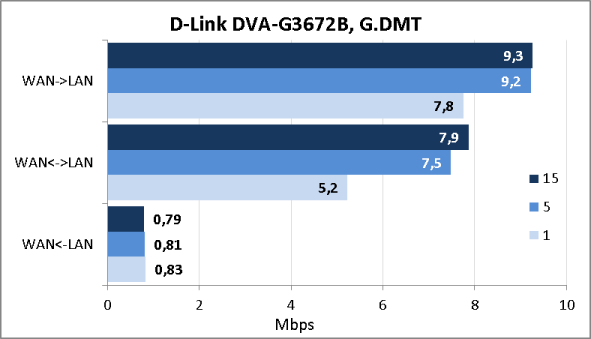 Apart from static routing, DVA-G3672B also supports RIP, dynamic routing protocol. 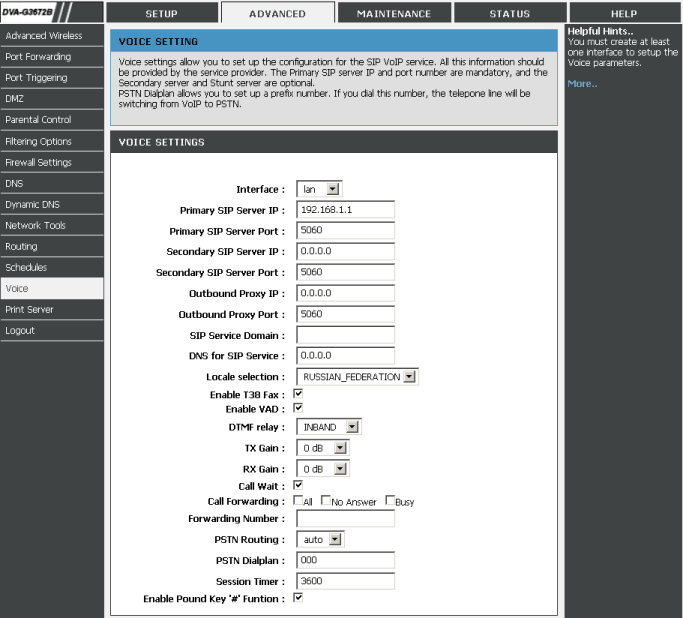 Using Voice menu item one can manage the connection of two analogue phones of DVA-G3672B to a SIP provider. The USB-port located on the device rear panel can be used to connect USB printers which can be adjusted using Print Server menu item. Unfortunately, one cannot connect either 3G/4G modems or external disks to this port. 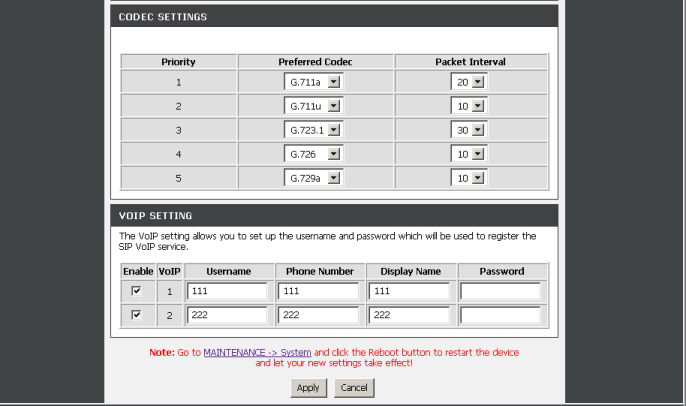 System menu item in MAINTENANCE tab allows rebooting the device and performing standard tasks with user settings. 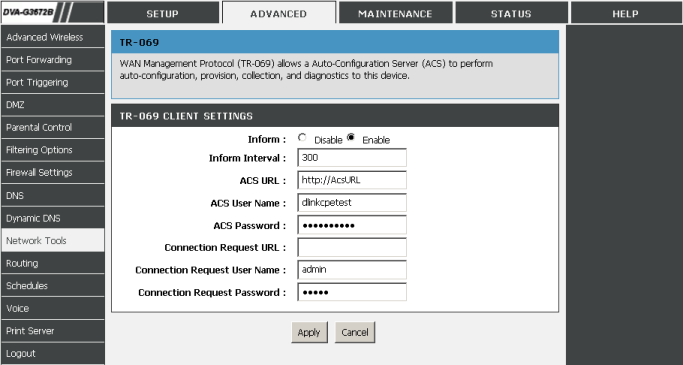 By using sections of Access Controls menu item the administrator can specify the access parameters to the router for purposes of control. 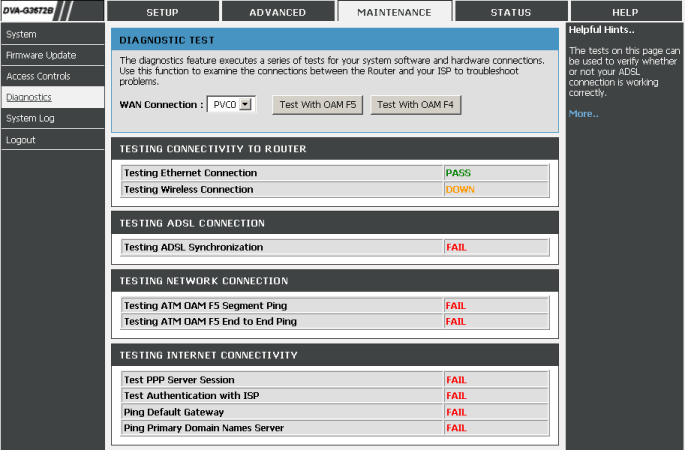 One can carry out a test of the local network segment and access to the Internet resources using Diagnostics menu item. Brief information about the device is located in Device Info menu item, STATUS tab. 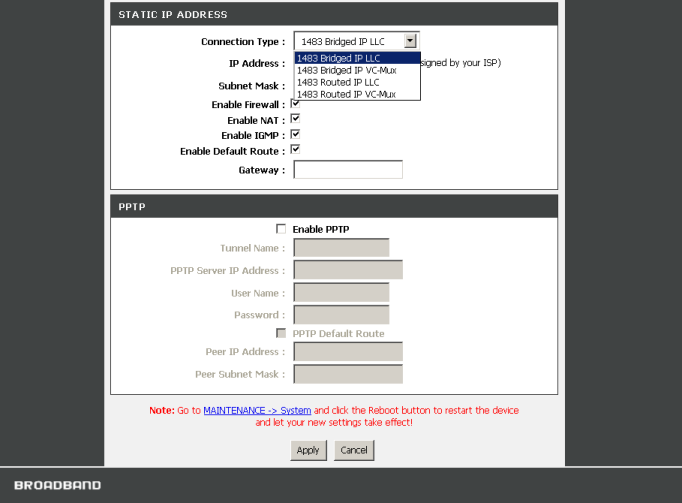 Using other menu items of STATUS tab the users can receive information about the connected wireless clients, distribution of IP-addresses using DHCP, view the routing table as well as other statistical and log data. 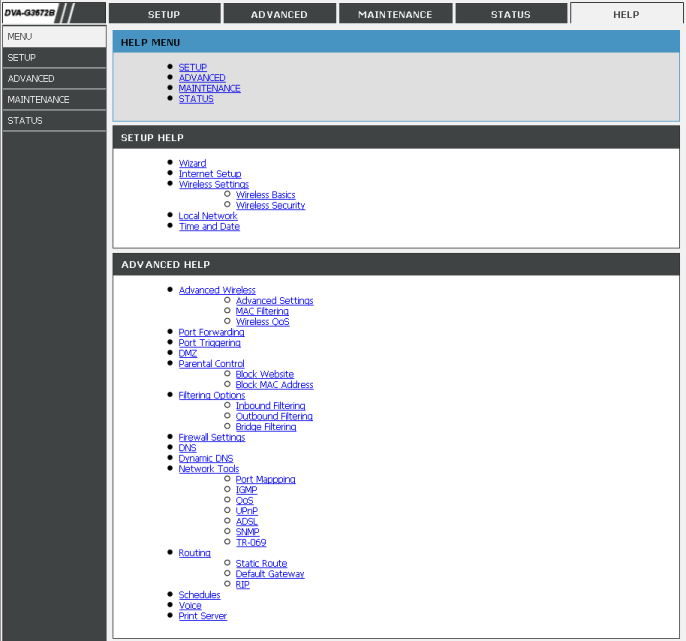 Help information on each section and menu item of the web-interface is available in HELP tab. Access to the command line can be granted or prohibited using Access Control menu item, MAINTENANCE tab. 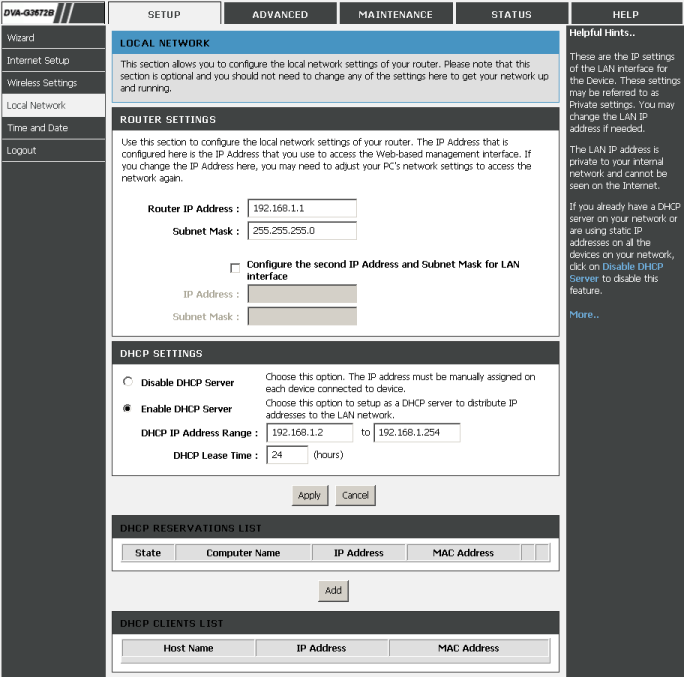 One must use the same logon information as for the connection to the device web-interface. Upon successful authentication an administrator will find him/herself in the menu. It's worth noticing that the command line interface design as a menu appeared in firmwares beginning from 1.10 version. Note: If you have problem with Backspace key, please make sure you configure your terminal emulator settings. For instance, from HyperTerminal you would need to use File->Properties->Setting->Back Space key sends. 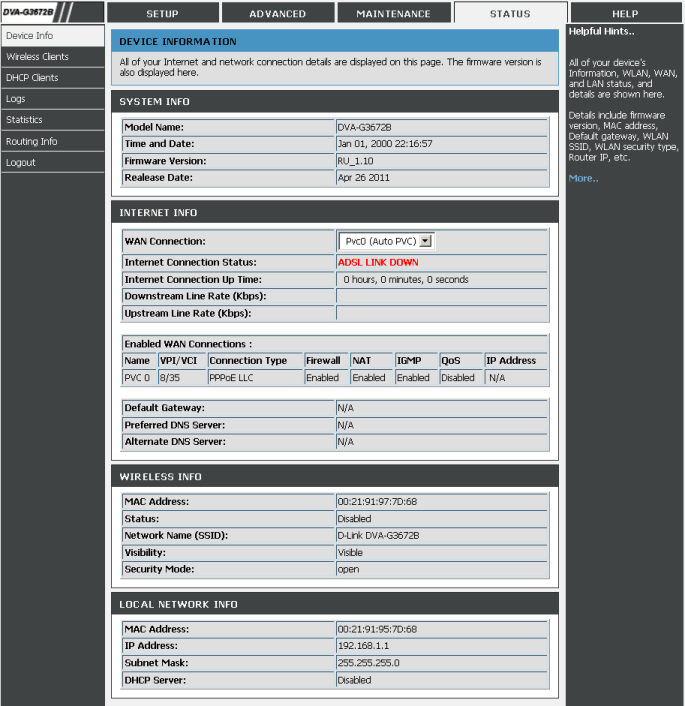 Information on the ADSL operation is located in the first item. The second and third items contain configuration of LAN and WAN interfaces, correspondingly. 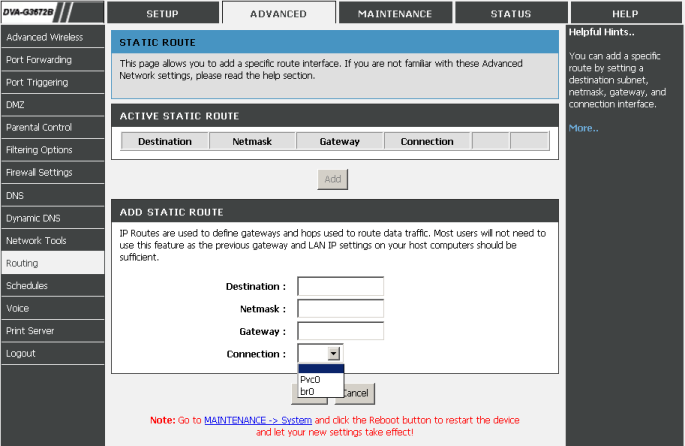 Access to the routing settings can be gained using the fifth item. The password management is performed in item 10. The user can carry out the line diagnostics in item 11. That's where we proceed to completion of the brief review of command line capabilities of the device switch and pass on to testing it. The first testing procedure we usually begin our testing section with is estimating the booting time of the device, which is a time interval starting with the moment when the power is on until the first echo reply is received through ICMP protocol. 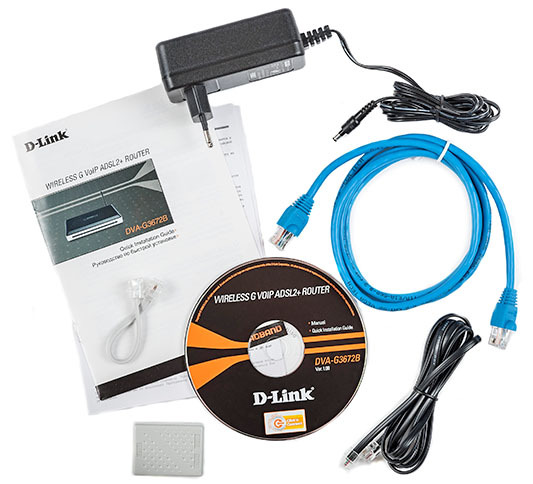 D-Link DVA-G3672B boots in 31 seconds. We believe that the result is decent. The next thing we usually do is conducting a security scanning procedure, which has been carried out using Positive Technologies XSpider 7.7 (Demo build 3100) utility. On the whole, there were six open ports discovered, and they are TCP-21 (FTP), TCP-22 (SSH), TCP-23 (Telnet), UDP-69 (TFTP), TCP-80 (HTTP) and TCP-631 (ipp). The most interesting data detected are presented below. After that we decided to measure the data transfer speed through ADSL not limiting ourselves by the use of high speed standards only. Neither did we keep away from performance tests of the wireless network segment of the device. 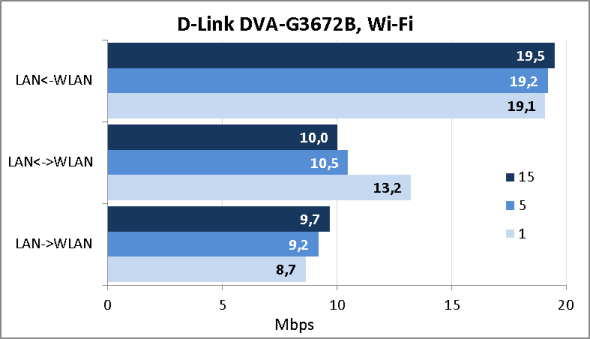 Judging by the functional capabilities of D-Link DVA-G3672B wireless router it'd be fair to notice that this device is intended for use in small offices or workshops. VoIP support will probably be useful for both enterprise and home users. As of when this article was being written, the average price for a D-Link DVA-G3672B in Moscow online shops was 2200 roubles.